The main hallway in my house is just narrow enough for a game – there’s no way to turn the corner into a room with the machine in “normal” horizontal position. The only way in and out is with the machine on it’s back with the backbox folded. You’re then free to move the machine around on the dolly at will and can turn narrow corners no problem – the machine is much easier to maneuver on its back. Once arrived at its destination, repeat the steps in reverse. The problem with the steps above is #3 – #4. It is a two person job – one person lifts the machine while the other removes the legs. I wanted a way to be able to do all the steps above by myself, so I decided to fabricate a wooden frame out of 2×6 lumber and 3/8″ plywood. 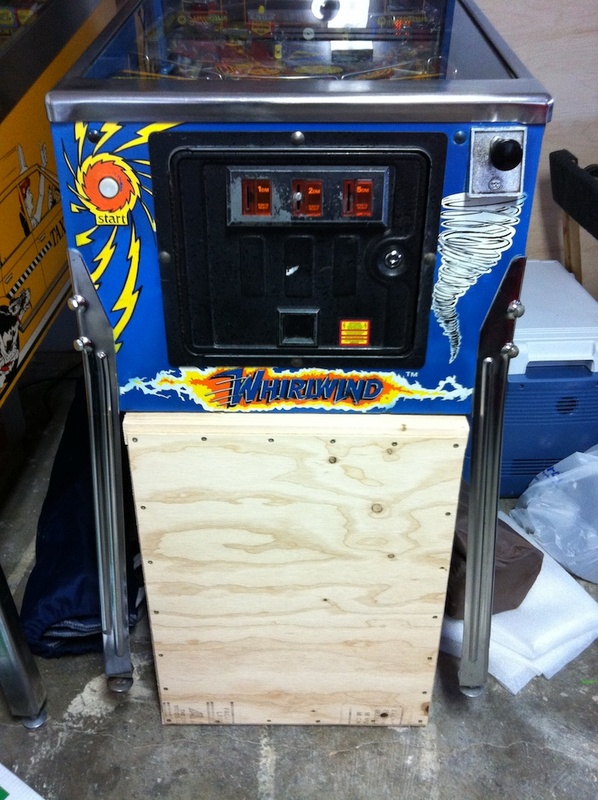 I measured against my games and 25″ is just high enough to lift a pinball off of its rear legs. The dimensions I ended up with are 18 1/2″ wide x 25″ high x 5 7/8″ deep. The 2x6s carry the brunt of the load while the plywood face provides stability and prevent the structure from collapsing to the side. Should be plenty beefy to support even the heaviest game! Here’s a pic of a test fitting on the front of Whirlwind!